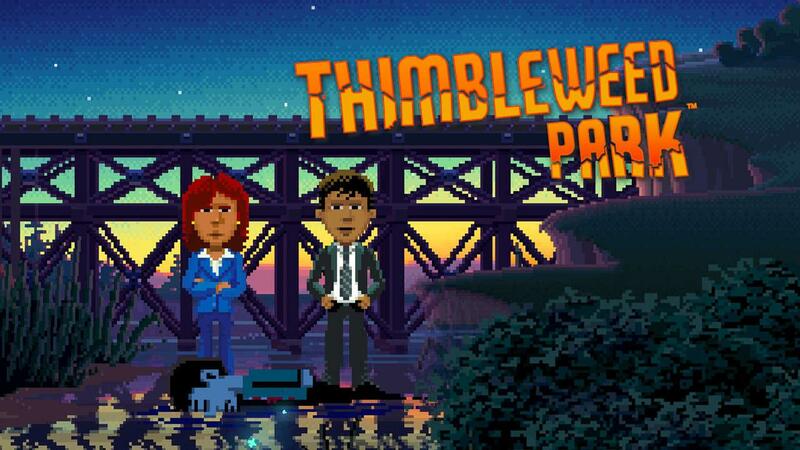 Thimbleweed Park is a point-and-click adventure game developed by Ron Gilbert and Gary Winnick. A spiritual successor to their previous games Maniac Mansion (1987) and The Secret of Monkey Island (1990), this game released to very positive reviews, with critics celebrating its humor, acting and writing. You can find the wikipedia page here, though the usual warning for spoilers should apply. How Long to Beat estimates about 14 hours to completion. Available on Microsoft Windows, macOS, iOS, Xbox One, PlayStation 4, Linux, Android, and Nintendo Switch. At the time of writing, it's free on the Epic Store and on sale on the PSN store. Please be mindful of your fellow goodjers and spoiler any discussion of plot points. You can find the main thread over this way. We'll be playing Thimbleweed Park in March 2019, with an extra month for stragglers. Have fun, everyone! I am so excited that this is our next game; I'm definitely in! Here's the main theme, just to set the tone. Not sure Ill get around this one in March. But weirder things have happened. I’m going to dabble in this one. See how far I get. Got it for free thanks to the Epic store so I’ll be happy even if I just get a taste of what the game is about. ok. i'll give this another shot. I tried it for a few minutes a while back but i have a big hangup about fourth-wall breaking stuff in my media (don't even talk to me about what I think of Deadpool!) and this game seemed have a lot of that up-front which rubbed me the wrong way. BUT i'll give it another shake and see if it sticks this time! I'm a big Ron Gilbert fan, so I'm in! Another month, another adventure added to the pile to play along with the club At least this one was free! So obviously I don't know how strongly you feel about putting time into games that you end up strongly disliking...but if I had a pet hate about fourth-wall-breaking then I'd probably want someone to warn me off Thimbleweed Park. I wish you luck with the gritting of your teeth. Sooooooo..... full disclosure, I’m not going to be replaying it. I’ll be queuing up my streams from last year, but I don’t have it in me to play it again. Much like Pyxi, the fourth wall breaking was over the top for me (and I like that kind of thing), and it just never clicked with me. I’ll be looking forwards to your thoughts though! And I’ll probably spoiler my more extensive observations later in the month. I've been meaning to ask, have you taken a break from Streaming? Or do I just keep missing the notifications? I think Prey Ep. 3 or 4 was the last one I saw. Well not intentionally, no. But we had a couple of deaths in the family this month and I wasn’t feeling up to it. I plan to do so this weekend though! With Pillars, probably, I still haven’t started that one! Interested in giving this one a go. I think I have sufficient affection for some combination of X-Files, Twin Peaks and Maniac Mansion (which seem to be the points of reference for the game?) that it makes sense that it might click well with me. Yeah, that header image basically sold me by itself. But it might have switched off Kickstarter backer references? The extended graveyard feels like it should have a lot of dumb backer stuff on the gravestones...instead I just spend ages walking right through empty screens to a door I can’t open and then have to walk all the way back again, so...still annoying, just a different kind of annoying. you can hold down to speed up but i don't think double click works. certainly not on long extended screens that scroll. I played 30 minutes just to "crack the seal." Suddenly, I'm a kid again trying to figure out Maniac Mansion. Well, first I chose Casual difficulty, then it was so simple -- click here, click on this, walk here -- that I started over on Hard and I'll just look online if I get stuck. If the 4th wall breaking continues at the same pace it will definitely be too much. Using "pixelated" for the corpse was clever and cute, but otherwise... eh. I expect one joke to land out of every 30 or so. That said, I'm liking the look and feel of the game so far. I started it today as well, but only played for about a half hour. I like it so far, and I laughed a few times. I think the signals are going to be strong throughout the whole game. Well, I just went and bought it on PS4 cause of trophies and the comfort. It is now downloading. Guess I'm in! Played a little last night, dig the humor - as expected. Good stuff, really. Those plumbers and the signal, hehehehe. 1 - Just wasn’t being through enough as Ransom the clown and didn’t click on his poster in his trailer to find his safe. Did figure out the combination on my own though. 2 - More in the category of “I probably could not have figured out on my own”: Making ink out of ash and gasoline (after using hot sauce to start a fire) for the niece who is applying to MucusPhlegm. 3- Dropping the dome through the sewer grate as Reyes for Rey. I realized I was role playing and not using player knowledge: Reyes doesn’t know Rey needs the dime in the sewer. Haha. I found Ransome to be terribly annoying, and I was glad this "level" wasn't too long. I'm kind of glad he was cursed, and I'm curious to encounter him in the present day (still haven't). Unfortunately, I am afraid he is going to be even more annoying now. I had a great time. I laughed several times, and the whole Mucusphlegm joke didn't get old (for me). And I also got a kick out of that Revenge of the Jedi poster, which of course I correctly identified (of course) before Delores said what it was. I'm also curious to run into her in the present day, and see how everything went. By the way, I'm playing on Casual, and so far I've only had to use the Hint line (what a great idea, by the way) once, and it was because I hadn't been paying enough attention to what the character had been saying. I mention this because I read what steinkrug spoilered above, and I realized my version of two of those puzzles was a lot less annoying... I mean, difficult . Clearly, I chose... wisely . I actually enjoyed the Ransome flashback. Found the character enjoyable in as far as playing as a terrible person can be. Really liked the back and forth with the carny and the whole stand-up show. What's with all the dust motes on the ground here and there? I've found about a dozen and noticed there's a trophy for it... wondering if it unlocks anything special. If anyone's curious, they're basically noticeable white pixels that appear randomly in different screens of the game, and there's trophies fro accruing specific amounts, with 75 being the max, iirc. I had been wondering about that too... Now I know! Pretty sure they are a sort of joke about old school LucasArts adventure games and "pixel hunting" for the right thing to click on. Also, with tying an achievement to them, a joke about collecting stuff in modern games. in order to get the achievements/trophies for the dust thingies, one has to actually pick them up. It can be with any of the characters as the count is cumulative in the game. Apparently, if you don't pick them all up in one go-around, the count carries over. Yeah, it definitely seems like commentary on collectathons and old school adventure games.